Khorasanizadeh, H., Aghaei, A., Ehteram, H., Dehghani Yazdeli, R., Hataminasar, N. (2014). Attaining Optimum Tilts of Flat Solar Surfaces Utilizing Measured Solar Data: Case Study for Ilam, Iran. 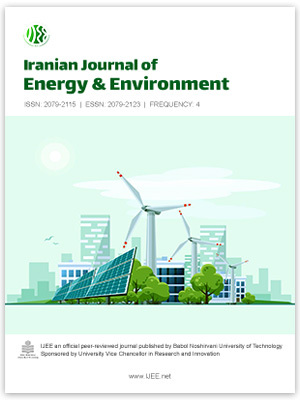 Iranian Journal of Energy and Environment; previously called: Iranica Journal of Energy & Environment, 5(3), -. H. Khorasanizadeh; A. Aghaei; H. Ehteram; R. Dehghani Yazdeli; N. Hataminasar. "Attaining Optimum Tilts of Flat Solar Surfaces Utilizing Measured Solar Data: Case Study for Ilam, Iran". Iranian Journal of Energy and Environment; previously called: Iranica Journal of Energy & Environment, 5, 3, 2014, -. Khorasanizadeh, H., Aghaei, A., Ehteram, H., Dehghani Yazdeli, R., Hataminasar, N. (2014). 'Attaining Optimum Tilts of Flat Solar Surfaces Utilizing Measured Solar Data: Case Study for Ilam, Iran', Iranian Journal of Energy and Environment; previously called: Iranica Journal of Energy & Environment, 5(3), pp. -. Khorasanizadeh, H., Aghaei, A., Ehteram, H., Dehghani Yazdeli, R., Hataminasar, N. Attaining Optimum Tilts of Flat Solar Surfaces Utilizing Measured Solar Data: Case Study for Ilam, Iran. Iranian Journal of Energy and Environment; previously called: Iranica Journal of Energy & Environment, 2014; 5(3): -.